Rice University CS alumnus Steve French presenting at the 2017 Linux Storage and File System Summit. “Linux Weekly News named me one of the top 10 core contributors to the last Linux release,” said Steven French, Rice University Computer Science alumnus (B.A. ’84). It’s the kind of recognition only his colleagues and other CS alumni appreciate. French first began contributing to the open source operating system in 2002 and would later co-author the SNIA CIFS Specification which defined how to store files across a network. The specification evolved into the Linux CIFS/SMB3 client and related components, which French continues to maintain and is widely used to access Windows, Macs, NAS appliances, Samba and the Cloud. 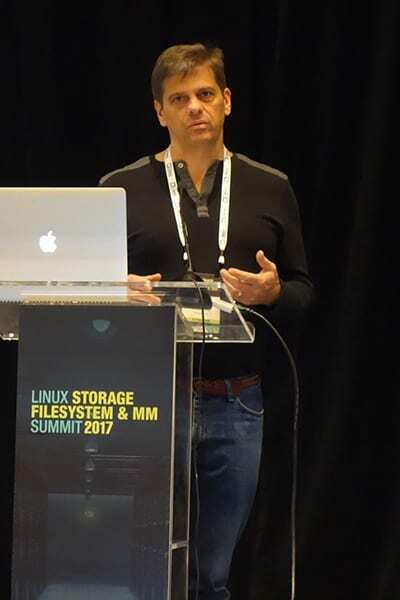 “Looking back over the past year, the file system I manage for Linux was the third most active file system in Linux, and the Linux kernel is the largest software project in the world. That means millions of users and it feels good to know my passion for designing better solutions for networks, storage, and file sharing tools is helping a lot of people on a daily basis,” said French. The protocols French has helped develop are used by devices that share files, from phones and computers to household appliances that share information across the Internet of Things (IoT). His primary focus has been CIFS (Common Internet File System), a protocol originally created for Windows and later expanded for other platforms, and the follow-on protocol which replaced it starting in 2012, SMB3. Steve French and Jeremy Allison, members of their respective Samba teams at Microsoft Azure and Google, present updates on SMB3. After completing his master’s in Electrical and Computer Engineering at Rice in 1988, French went to work as software engineer for IBM, working on operating systems software, and learning about file systems and network file systems, and eventually becoming the lead developer for networking components of OS/2. “CIFS was created in 1984 (and originally named “Server Message Block protocol”), by Dr. Barry Feigenbaum at IBM, the same year I was applying to grad school. It was invented the same year as the NFS protocol, and those two protocols have lasted over 30 years. They led to various industry efforts to improve, and perhaps more importantly adequately document, these highly complex protocols, and they’ve survived while every other network file protocol has gone away,” he said. Although he relished his deep dive into the problems of sharing files between physical systems, including time spent as the Network File System Architect for IBM, he became intrigued by the possibilities of file sharing in the cloud, and moved to Microsoft last year to work on Azure, improving access to cloud storage from Linux. He’s eager to work on issues like data retention and integrity, twin issues French said are familiar to anyone who has tried to retrieve a file from a crashed computer or from an old version of an important document. As the demand for file storage grows, retrieving archived files becomes more problematic. “None of us at Rice in 1984 imagined that some of the most brilliant people in the world would be concerned with the storage growth rate – our demand for storage is doubling every three, four, or five years,” said French. French believes improved protocols like SMB3 and its follow-ons will hold the key to making it easier to access this rapidly growing amount of network storage from legacy applications, the usual applications that users are used to. French is also excited about representing both the Computer Science and Electrical and Computer Engineering departments as a Rice Engineering Alumni board member. This spring, the REA and the School of Engineering will provide over $150,000 in scholarships and awards for current Rice students. His career advice for current students and entry-level engineers is to learn to write well. Read more in the companion piece to this story on LinkedIn. Steven French completed his B.A. in Computer Science in 1984 and his M.S. in Electrical and Computer Engineering in 1988.